Lauren Owen’s debut novel is a difficult one to assign a rating. Overall it is an above-average book and will be of interest to many readers. However, the enjoyment of it I think will vary quite substantially from reader to reader, in a not-too-easy to predict fashion. If the plot (including the ‘twist’) is something you find intriguing, you should definitely check this out. It is extremely well-written and Gothic-moody, but its execution and the ultimate direction of its plot may cause some frustrations. Some have considered discussion of what this book is about to be a spoiler. Given the implications of the title, I don’t take this to be the case. Though not mentioned in the novel’s summary ‘blurb’, I think it unfair to try and rope people into reading a story they may have no interest in. Knowing what the story ultimately about doesn’t spoil much, in fact it probably makes the surprise transition from the first third of the book to the remainder far easier to go along with. So without further ado, if you REALLY REALLY don’t want to know anything more about the novel, you’ll have to stop reading. 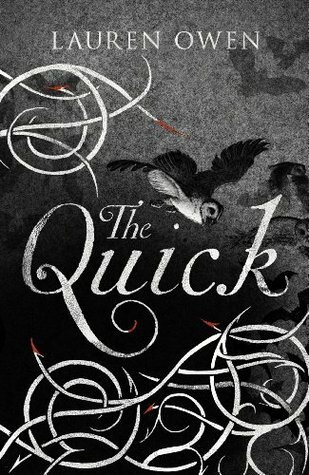 “The Quick” starts off as a fabulously engrossing Gothic story about a secret society, and of a sister and brother living in a large empty home in the absence of their parents, under the care of a servant as their father is away. The first third of the novel focuses upon the brother, grown up and at university, as he makes roommates, friends, and eventually romantic ties with a gentleman he meets there. Throughout this portion of the book the story is filled with a literary richness, excellent characterization, continued foreboding Gothic tensions, and drives forward certain expectations on how one suspects the plot may unfold. These expectations are then shattered when tragedy strikes and the focus of the novel shifts to bring in the identity of this secret society brought up back in the prologue. Vampires. The remainder of the novel is a story about vampires, what the society is about, why they have done what they’ve done, and what the ramifications will be for both the brother and the sister. After a portion of the novel written in the form of diary by a man associated with the vampire society (to explain their characteristics and background history to the reader) the novel continues the ‘action’ of the plot by shifting back to the sister, who now arrives in search of her brother. The dual focus, split in the book, between the brother and the sister is not a major problem. With the sudden plot twist of bringing in vampires, this split focus is perfectly valid. The shattering of reader expectations based on the first third of the book isn’t even necessarily a bad thing. It’s great to have cliched expectations shattered. The problem becomes when one potential expected plotline is simply replaced with another completely different one that begins to feel even more cliched and predictable. Sadly, I feel this is largely what happens with “The Quick”. Vampire novels have been done to death. Here it is made somewhat unique by giving it a strong classic literary and Gothic style as opposed to the more recent takes on the subject. The addition of these vampires in an organized society led by one particularly visionary individual gives the vampire plotline even greater potential to take on something new in this novel. This individual does not merely look on the normal “Quick” humanity with ambivalence or disdain. Rather he views them with a sort of pity, claiming a desire to use the society’s powers and influence to not simply survive and feed, but to try and find ways to improve and better humankind. This is a very interesting concept. Unfortunately, the concept is never developed. Instead the novel becomes a rather standard (though consisting of great prose) novel of fighting against the vampire society’s plans. The supposed ‘well-meaning’ intentions of the vampire leader turn out to be disingenuous, mainly a victim of power corrupting, turning him into a typical vampire monster and thereby negating any potential exploration of a vampire doing great things while also having to rely on predation. Those who simply adore well written Gothic novels, fans of vampire fiction, and the like will enjoy this book greatly, even if they don’t love it. Those unsuspecting and disinterested in the vampire plot may feel misled, and those that fell in love with the literary beauty of the first third of the novel may become disappointed by its turn into rather predictable genre fiction, albeit with a continued ‘literary’ style of prose.